In February I reviewed a Thinkpad X1 Carbon Gen 1  that I bought on Ebay. The first thing to note is that it has USB-C for charging. The charger continues the trend towards smaller and lighter chargers and also allows me to charge my phone from the same charger so it’s one less charger to carry. The X1 Carbon comes with a 65W charger, but when I got a second charger it was only 45W but was also smaller and lighter. The laptop itself is also slightly smaller in every dimension than my Gen 1 version as well as being noticeably lighter. One thing I noticed is that the KDE power applet disappears when battery is full – maybe due to my history of buying refurbished laptops I haven’t had a battery report itself as full before. Disabling the touch pad in the BIOS doesn’t work. This is annoying, there are 2 devices for mouse type input so I need to configure Xorg to only read from the Trackpoint. The labels on the lid are upside down from the perspective of the person using it (but right way up for people sitting opposite them). This looks nice for observers, but means that you tend to put your laptop the wrong way around on your desk a lot before you get used to it. It is also fancier than the older model, the red LED on the cover for the dot in the I in Thinkpad is one of the minor fancy features. As the new case is thinner than the old one (which was thin compared to most other laptops) it’s difficult to open. You can’t easily get your fingers under the lid to lift it up. One really annoying design choice was to have a proprietary Ethernet socket with a special dongle. If the dongle is lost or damaged it will probably be expensive to replace. An extra USB socket and a USB Ethernet device would be much more useful. The next deficiency is that it has one USB-C/DisplayPort/Thunderbolt port and 2 USB 3.1 ports. USB-C is going to be used for everything in the near future and a laptop with only a single USB-C port will be as annoying then as one with a single USB 2/3 port would be right now. Making a small laptop requires some engineering trade-offs and I can understand them limiting the number of USB 3.1 ports to save space. But having two or more USB-C ports wouldn’t have taken much space – it would take no extra space to have a USB-C port in place of the proprietary Ethernet port. It also has only a HDMI port for display, the USB-C/Thunderbolt/DisplayPort port is likely to be used for some USB-C device when you want an external display. The Lenovo advertising says “So you get Thunderbolt, USB-C, and DisplayPort all rolled into one”, but really you get “a choice of one of Thunderbolt, USB-C, or DisplayPort at any time”. How annoying would it be to disconnect your monitor because you want to read a USB-C storage device? As an aside this might work out OK if you can have a DisplayPort monitor that also acts as a USB-C hub on the same cable. But if so requiring a monitor that isn’t even on sale now to make my laptop work properly isn’t a good strategy. One problem I have is that resume from suspend requires holding down power button. I’m not sure if it’s hardware or software issue. But suspend on lid close works correctly and also suspend on inactivity when running on battery power. The X1 Carbon Gen 1 that I own doesn’t suspend on lid close or inactivity (due to a Linux configuration issue). So I have one laptop that won’t suspend correctly and one that won’t resume correctly. The CPU is an i5-8250U which rates 7,678 according to cpubenchmark.net . That’s 92% faster than the i7 in my personal Thinkpad and more importantly I’m likely to actually get that performance without having the CPU overheat and slow down, that said I got a thermal warning during the Debian install process which is a bad sign. It’s also only 114% faster than the CPU in the Thinkpad T420 I bought in 2013. The model I got doesn’t have the fastest possible CPU, but I think that the T420 didn’t either. A 114% increase in CPU speed over 5 years is a long way from the factor of 4 or more that Moore’s law would have predicted. The keyboard has the stupid positions for the PgUp and PgDn keys I noted on my last review. It’s still annoying and slows me down, but I am starting to get used to it. The display is FullHD, it’s nice to have a laptop with the same resolution as my phone. It also has a slider to cover the built in camera which MIGHT also cause the microphone to be disconnected. It’s nice that hardware manufacturers are noticing that some customers care about privacy. The storage is NVMe. That’s a nice feature, although being only 240G may be a problem for some uses. Definitely a nice laptop if someone else is paying. The fact that it had cooling issues from the first install is a concern. Laptops have always had problems with cooling and when a laptop has cooling problems before getting any dust inside it’s probably going to perform poorly in a few years. Lenovo has gone too far trying to make it thin and light. I’d rather have the same laptop but slightly thicker, with a built-in Ethernet port, more USB ports, and a larger battery. Huh? The spec sheet lists two Thunderbolt 3 ports, not one. Judging from the image (https://www.notebookcheck.com/fileadmin/_processed_/5/8/csm_IMG_4374_f35963453f.jpg), and my experience with the T480s, both are on the left side, near the end. One is a bit recessed to provide more stability for docking purposes, and has the mini ethernet next to it. I hope, that Lenovo will have a product with those features ready before my X220 dies. > Lenovo has gone too far trying to make it thin and light. I’d rather have the same laptop but slightly thicker, with a built-in Ethernet port, more USB ports, and a larger battery. This is why they make the t480(s)…. It sounds like you just got the wrong model. The X1v6 has known issues with suspend. It drains a lot of power because S3 isn’t supported. Yep, I’d be annoyed by a proprietary ethernet port too. Minor nitpick – Moore’s Law is about the number of transistors, not the speed. The i5-2520 in a T420 had about 600 million transistors, and the i5-8250 in the X1 would have upward of 2 billion (mainly because the lithography resolution dropped from 32nm to 14nm). So the law is still hanging in there – but we are going to hit some hard physics limits in the next decade or so. The real issue with benchmark speeds is that we have hit physical clock frequency limits and cooling issues years ago, so that the single core speed has hardly increased at all, and parallelization does not give a linear improvement for many tasks. Julian: It turns out that you are correct, there are 2*USB-C ports, but one of those ports is for charging. So if both of them work for Thunderbolt then that would only be useful in the case where you have 2 Thunderbolt devices connected and don’t need a charger. As having multiple Thunderbolt devices is probably correlated with high power use that wouldn’t work too well. The Thinkpad in question won’t work for an 8 hour day doing nothing but basic web browsing. It would have been more accurate to say “1 USB-C port usable after you plug in the charger”. HN: Yes I’ve used T series before, I bought myself a T420 in 2013. But I want something that’s not as wide and a little lighter. There’s a lot of space between the X1 Carbon and the T420 for another Thinkpad! Phillip: Thanks for mentioning that. On Twitter Julien Goodwin pointed that out and I’m trying to get the BIOS updated. neonsignal: Thanks for going into this in detail. It’s a bit disappointing that with more than 3* the transistors it’s only slightly more than twice as fast as the i5-2520. If they had just made a quad-core CPU with smaller caches it would probably have given a better result. Also a nice thing is that the TDP of the i5-8250 is a lot lower which is fortunate as the X1-Carbon has MUCH smaller cooling vents than the T420. To note: 1.30 that was just released fixed that. But if you dual boot with Windows, you will need to reinstall Windows when you toggle the option. It’s explicitly unsupported by Microsoft to change this particular suspend setting post-install. Get a Thinkpad T480. Much better, completely servicable by an experienced user (no soldiered on RAM and other garbage) for a tradeoff of a few millimeters in size. 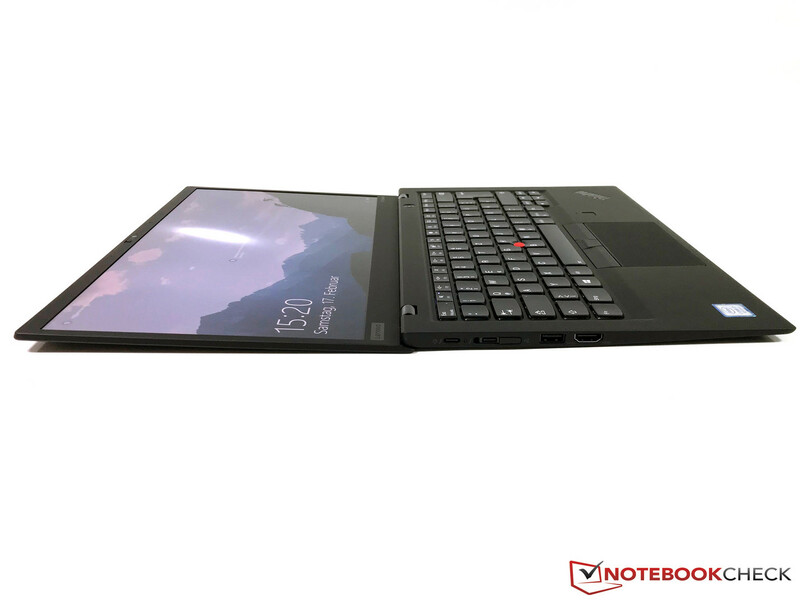 Comparing the latest X1 Carbon to a T420 is like comparing apples and oranges. Comparing it to the T480 is accurate and then the size difference is a few millimeters with many advantages over the X1 because everything is still self serviceable (no soldiered RAM for example) and not totally proprietary like the ethernet connector.